Area No. 1 The original service area as it was September 22, 1947, when the $500,000 debt limit was established by the founding board of directors. This covered approximately 4,290 square miles of area. Plans were drawn for three substations, 50 miles of transmission line, and 1,283 miles of distribution line to serve 1,228 consumers were made. Area No. 2 The northwest corner of Corson County was added to the service area December 10, 1947, when the Board of Directors approved a resolution stating that the ultimate system would include all of Corson County and that portion of Dewey and Ziebach Counties lying north of the Moreau River. This enlarged M.G.E.’s service area to approximately 5,086 square miles. Plans were made for four substations, 50 miles of transmission line, and 1,636 miles of distribution line to serve 1,475 members. Area No. 3 Bids for construction of facilities to provide electric service in the areas of Dewey and Ziebach Counties south of the Moreau River were opened at the April 1953 board meeting. 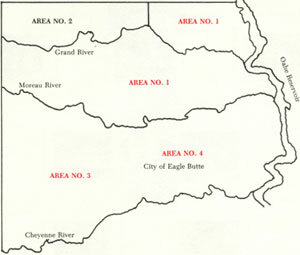 The expansion of Moreau-Grand to this area established the service area as it is today with the exception of the city of Eagle Butte. Area No. 4 The purchase of the Eagle Butte Light and Power Company from Mr. and Mrs. Jerome Payne on November 4, 1957, completed the area as served by Moreau-Grand today.